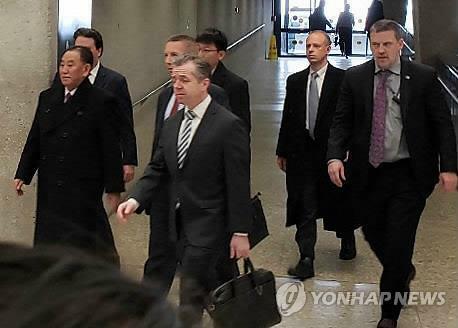 WASHINGTON, Jan. 19 (Yonhap) -- A top North Korean official wrapped up a three-day visit to the United States Saturday after meeting with U.S. President Donald Trump and agreeing to hold a second bilateral summit next month. Kim and his entourage refused to answer reporters' questions about Friday's meeting with Trump at the White House or Kim's earlier meeting with U.S. Secretary of State Mike Pompeo. Both sides were visibly quiet about the envoy's visit, with the State Department confirming the Kim-Pompeo meeting only hours before it took place at the North Korean delegation's hotel Friday morning. The White House announced after Kim had departed the grounds that he and Trump met for an hour and half to discuss the North's denuclearization and a second summit. The next summit will happen "near the end of February" at a location to be announced at a later date, it said. Vietnam has been widely reported as the likely site, with both the U.S. and North Korea having embassies there. The U.S. has maintained that sanctions on the North will remain until it fully and verifiably dismantles its nuclear weapons program, while the North has demanded concessions for the steps it has taken so far, including the dismantling of a nuclear testing site. Kim was the first North Korean official to fly directly into Washington without a stopover in another U.S. city. The last senior Pyongyang official to stay in the U.S. capital overnight was the late Vice Marshal Jo Myong-rok, who visited Washington in October 2000 and met with then U.S. President Bill Clinton.